Melbourne Storm coach Craig Bellamy has a well-known practice of sending his first-year players to work on a building site. The veteran coach does this to remind his players being a professional footballer is a privilege, something those who have never worked before don’t always understand. New Storm signing Ryley Jacks knows the difference all too well. In November last year the 24-year-old left his job as a qualified carpenter and moved to Melbourne to sign with the Storm. It is his second crack at NRL football after spending a year of under-20s and a reserve grade season with the Sydney Roosters from 2011 to 2013. But after his time in Sydney, Jacks went home to Brisbane and spent three years grinding through his 6am starts for work then driving 90 minutes from Brisbane to the Sunshine Coast to train with the Falcons. But he doesn’t regret a minute of it as it led to the Storm where he will likely make his club debut at this weekend’s Auckland Nines tournament. “It hurt when I was let go by the Roosters but it makes you stronger then having to go to work and also play footy makes you appreciate how good full-time athletes have it,” Jacks said. Jacks thought he had escaped the building site, then Bellamy sent him right back for a two-week stint same as the other Storm rookies. With a bit of luck Jacks won’t be back on the job for many years to come. Last season Jacks starred at halfback for the Falcons winning player of the year at the club and earning a healthy share of votes at Queensland Cup level due to his powerful runs and good passing. The biggest adjustment for Jacks was realising he had to keep his concentration up throughout a day of training, workouts and meetings. “They always demand the best of you and you can’t slack off at any point,” Jacks said. There is a place for Jacks in the Storm’s lineup, too, with Blake Green’s departure leaving the five-eighth role empty, for now. But with young guns Cameron Munster or Curtis Scott shaping as the leaders to fill the hole, a well-built and experienced playmaker like Jacks could make the move into the five-eighth role. 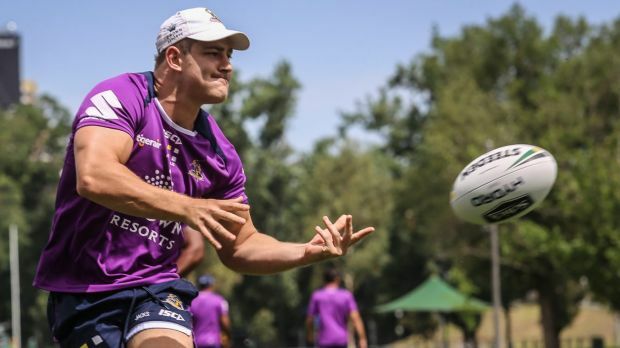 “I was the halfback with Sunshine Coast and I guess down here they are looking to fill in that half position on the left side, Cooper Cronk runs the right side,” Jacks said. If Jacks can earn his NRL debut this season it will be an achievement hard won. “The goal is to get a game, just to get one game would be unreal but that’s everyone’s goal at this level,” Jacks said. 1 Reply to "From carpenter to the Melbourne Storm, Ryley Jacks builds NRL career"